A native of Korea, Okkyung Lee has been developing her own voice in a contemporary cello performance, improvisation and composition for more than a decade. Without being bound to any specific genre or style, her unique blend of music is drawn out of classical, jazz, sounds, Korean traditional and pop music, noise with extended techniques. Based in New York since 2000, Okkyung has released numerous albums both in the States and Europe: two album as a leader, Nihm and Noisy Love Songs (for George Dyer), both on Tzadik; duo album Anicca with legendary English vocalist Phil Minton for Dancing Wayang; The Bleeding Edge with saxophonist Evan Parker and trumpeter Peter Evans on Psi; solo cello album I Saw The Ghost Of An Unknown Soul And It Said... on Ecstatic Peace! ; duo recording with turntablist Christian Marclay, Rubbings on My Cat Is An Alien (LP)/A Silnet Place (CD). Currently she finished recording a new solo album in addition to a duo album with bassist John Edwards (FaTaKa), and another duo album with Paul Lytton(Psi). Okkyung has also worked with many visual artists and choreographers developing multi-disciplinary performances that were presented at Dance Theater Workshop, Issue Project Room, roulette and The Kitchen in New York. 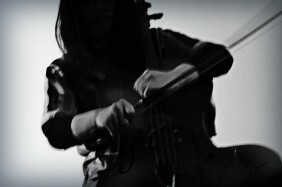 Her versatility as a cellist has led Okkyung to work with countless artists from many different facets of contemporary music such as Laurie Anderson, David Berhman, John Butcher, Nels Cline, Chris Corsano, Fred Frith, Carlos Giffoni, Vijay Iyer, Mike Ladd, Paul Lytton, Lasse Marhaug, Thurston Moore, Ikue Mori, Lawrence D. "Butch" Morris, Marina Rosenfeld, Jim o'Rourke, John Tilbury, C Spencer Yeh and John Zorn to name a few. She has received a composer commission from New York State Council On The Arts in 2007 and prestigious Foundation For Contemporary Arts Grant in 2010 in music. Okkyung holds dual bachelor's degrees in Film Scoring/Contemporary Writing & Production from Berklee College Of Music, and master's degree in Contemporary Improvisation from New England Conservatory Of Music.